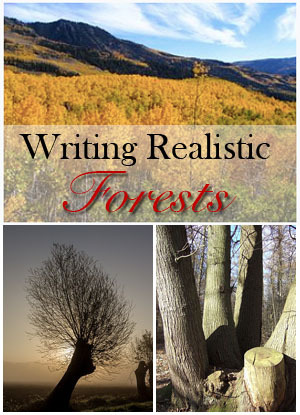 This article on writing realistic forests is part of the Science in Sci-fi, Fact in Fantasy blog series. Each week, we tackle one of the scientific or technological concepts pervasive in sci-fi (space travel, genetic engineering, artificial intelligence, etc.) with input from an expert. 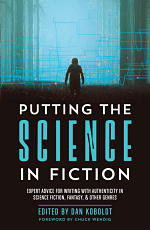 Terry Newman is a former medical researcher and electron microscopist, turned comedy writer, playwright, film writer and Kindle Best-selling author. 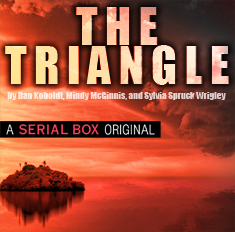 His debut novel Detective Strongoak and the Case of the Dead Elf was a #1 Kindle Bestseller in Epic Fantasy. His latest book The Resurrection Show is written with cardiologist and composer David Alter and has tunes. Strangely though, the job he always remembers with the greatest affection involved wandering round woodlands surveying trees. Trees are great. Most people like trees. I wouldn’t trust anybody who didn’t. Trees are of course a staple of fantasy writing – how much more ‘fantasy’ can you get than a ‘sylvan glade’ in an enchanted forest +/- elf? Trees can also be a valuable addition to SF writing as well. Nothing says ‘alien’ more than strangely coloured BIG woody vegetation – except maybe a six-legged beast with a large horn in the middle of its forehead. However, it’s surprising how often trees and woods are used as nothing more than ‘scenery’ in a story, when they could contribute so much more. Basically there is a lot of ignorance about trees and probably even more so about the assemblages of trees that we call woods and forests. The last two terms not just being defined by the number of trees present – although forests are usually larger than woods – but also by the density of tree growth and hence how open or closed the canopy may be. A closed canopy usually demarcates a forest, if you’re wondering. The words came into the English language from different sources. Wood comes directly from English’s Germanic root, from the Middle English ‘wode’ and before that the Old English word ‘widu’. 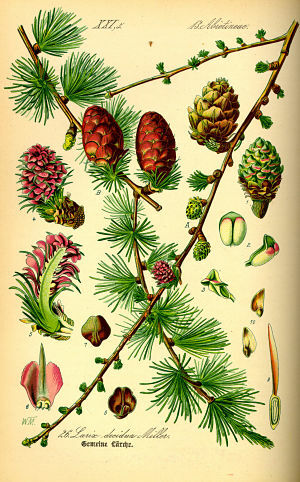 Forest came in with the invading Normans, but unlike much French, which has a Latin root, it was also derived from the Germanic, in this case for a pine or fir tree. This article is intended to help give writers a basic grounding in ‘Telling the Wood from the Trees’ and informing them about trees and woods in what one would (mostly) call the more temperate of wooded lands. Jungles can wait. The term ‘ancient woodland’ is used in the UK to refer to any wooded land that has existed for the last 400 years, and that may well have also existed for thousands of years, since the last Ice Age – some 11,000 years ago. If you live somewhere that doesn’t have a handy ice age to count from, you might well be using terms like ‘primary forest’, ‘virgin forest’ or ‘old growth forest’ instead. The emphasis here is on an ecosystem that can be considered a climax community. That is a biological community of plants, animals, and of course fungi which, through the process of ecological succession in a location over generations, has reached a steady state. One of the major preconceptions of the general population, with regard to a largish collection of trees, is that it must be ‘natural’. Obviously, it depends on your location, but if you are in a reasonably well populated area with a basic level of technology (even in your fantasy world) that wood will be managed to some degree. Trees are a resource, wood is a valuable crop and there is not a wooded-place in a country like England (should your world be something like England) where the woods are really natural. The phrase usually used then is ‘ancient and semi-natural woodlands’. As much as I loved Robert Holdstock’s ‘Mythago Wood’ books it’s hard to imagine three square miles of woodland that has remained undisturbed and unmanaged since the last ice age – even in relatively remote Herefordshire. The evidence for such management is not necessarily seen just in whole-scale clearances and tree felling. One of the most common methods of tree management involves coppicing and pollarding. These are two cutting and pruning techniques used to produce useful wooden hurdles or poles, taking advantage of the ability of some trees to naturally regenerate from the cut base, or stool, to produce lots of long shoots. Coppicing involves cutting low (15 cm) to the ground, while pollarding involves cutting higher from the ground (1.5 – 2.5 m) so that deer and cattle can’t eat the new growth. Coppicing, by preventing a tree from maturing, also increases the longevity of a tree. In the case of one English lime tree apparently to something like 2000 years. 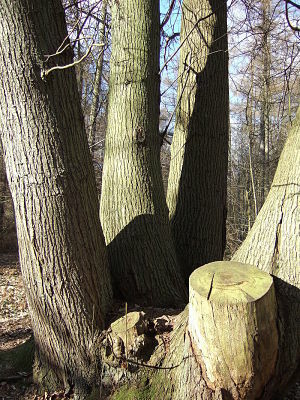 Pollarding produces the sort of trunks that have swollen areas that sometimes really can look the faces of woodland spirits – but actually (apart from natural accidents) they are more likely to be evidence of human activity. Pollarded trees are more often found in wooded pasture and at boundary sites than in woodlands. These techniques all help characterise woodlands. They are old techniques – in some places dating back to the Bronze Age. Different trees tended to be used then, and now, for different functions. Willow, being so flexible, makes excellent baskets and even some furniture. Ash produces strong straight poles excellent for tool handles and brooms. Sweet chestnut is ideal for fence posts and sheep pens. Hazel is most likely to be used for thatching, spars for hedge laying and hurdle making. The very hard broadleaf tree, hornbeam, was used for charcoal making. If that sounds strange, you have to remember that another primary use of coppicing and pollarding was to provide firewood. It was fuel and it is far easier to cut coppicing poles than to fell an entire tree and then divide that into logs. Bundles of branches are not just suitable for burning they can also produce a winter fodder crop sometimes known as tree hay. Want to give your story authenticity, have your pasture animals eating tree hay. What Tree is it Anyway? Trees come in all different shapes and sizes. It’s part of the reason why trees are such fun. They include some of the oldest organisms on earth and some of the largest. The Great Basin Bristlecone Pine is a species of pine tree found in the American West, mostly in Utah, Nevada, and California. One of these trees is calculated to be 5,065 years old! Yes, there are older organisms in the world, but they tend to be colonial, which doesn’t count in my book. So the bristle cone pine is the longest living non-colonial organism on Earth (probably). In terms of size, yes we know about blue whales and giant squid, and there is a honey fungus that measures 2.4 miles (3.8 km) across living in the Blue Mountains of Oregon that probably qualifies as the largest of organisms. But growing underground doesn’t really impress like a 379.7 feet tall giant redwood or the group of genetically identical trees that stretches across more than 100 acres of Utah’s Fishlake National Forest. 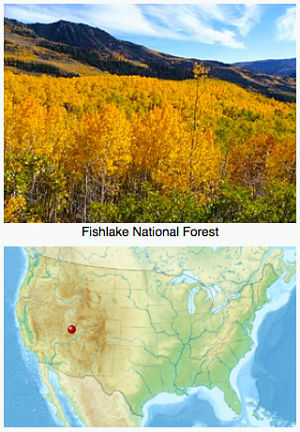 These quaking aspens, also considered one of the most massive living organisms on earth, grow in groups called stands. Within these stands, a single tree will spread by sprouting new stems from its roots, often several feet from the original trunk. This brings us to an interesting idea that really does seem to be straight out of James Cameron’s ‘Avatar’. Trees probably talk to each other. No, not ents (which aren’t trees but tree shepherds of course), but real live trees. After laboratory experiments showed that pine trees can share nutrients, more extensive ecological experiments indicated that different species of trees might be in contact with each other. Mother trees might be able to help ‘feed’ their young, even reducing their own root growth to allow their babies more room. This ability appears to be linked to mycelia, the massive web of hair-like mushroom threads that grow underground throughout forests. Many of these fungal threads form a symbiotic association with the roots of a vascular host plant. These mycorrhizal fungi can, it seems, transmit messages between trees, triggering them to share nutrients and water with those in need. Mind you, you have to be online, of course. So, the forest – perhaps just one giant super organism or at least a very interlinked ecosystem. In considering tree classifications we are mostly concerned with simple definitions. Distinctions like evergreen and deciduous and broadleaf and needle-bearing, seem quite straightforward, but don’t be confused into thinking that evergreen = needle bearing. The needle bearing European Larch is deciduous, dropping all of its needles in the autumn – they go yellow – but this larch retains its cones! Some broadleaf trees however, are evergreen, rather than deciduous. The Holly being the most famous for this with the hedge-forming box close behind. Softwoods and hardwoods are another easy to recognise classification. In general, softwood comes from conifers, which usually remain evergreen, while hardwood comes from deciduous trees that lose their leaves annually. Hardwoods tend to be slower growing, and are therefore usually more dense. Hardwoods can also be monocotyledons and angiosperms. Although ‘monocots’ differ from ‘dicots’ in four distinct structural ways: leaves, stems, roots and flowers, the main difference, which they are named from, is the so-called seed leaf. Monocot trees including palms, bamboo and coconut timber, have one leaf, while dicots (alders to zebrawood) have two such leaves. ‘I’ll just go collect some wood for the fire’. How often have you read that in a book or heard it in a film? Well, basically, good luck. A lot of wood isn’t too keen on burning. Anything wet would probably rather not and wood does get wet rather quickly when it hangs around. New wood doesn’t like burning very much either, which is one of the reason logs get seasoned. Of course logs aren’t easy to find in a forest (they don’t grow on trees, ha) and that means finding some branches small enough to transport, yet large enough to produce a reasonable amount of heat and thus not require constant topping up. Who wants to go into the wood at night? Yes, people do – but mostly when you want them dead. When somebody goes to get wood for a fire – everybody should go get the wood! Then once you have got what looks like enough, go get the same again. A useful rule of thumb is that usually you need twice as much wood as you would imagine. Large branches do not break easily and, unless you carry a handy axe around with you, your sword isn’t going to do the trick. Of course you may have a handy laser pistol instead, but then you probably wouldn’t need firewood anyway. All good Boy Scouts know that wood that doesn’t snap isn’t good to burn and that you can break some dead twig of a tree to help get a fire started. This is true. These will last about five minutes and not warm you much, let alone heat a handy pot. You can see why coppicing is such a good idea to produce some good evenly sized bundles of firewood. And if you have experience of a nice indoor wood-burning stove remember that an open fire will burn around five times more than a wood-burning stove. Remember it is harder to start a fire in the cold as well. I live in a village that has had a prominent role in the development of the game of cricket since 1876. I happened to be walking the dog one morning in late summer when I was suddenly aware of something. This something was the sound of the wind. More specifically I was actually listening to ‘The Wind in the Willows’. Willow being used to make cricket bats (as I’m sure you all know) there is a lot of growing it around here as we have the most famous cricket bat manufacturer in the world located here. This rather blew my mind – the WIND in the WILLOWS – the hairs rose on my neck. It was so evocative, a sort of rustling sound, and it transported me immediately to one of my favourite childhood books. Half way round the world. I am standing in the Vallée de Mai Nature Reserve on the island of Praslin in the Seychelles. 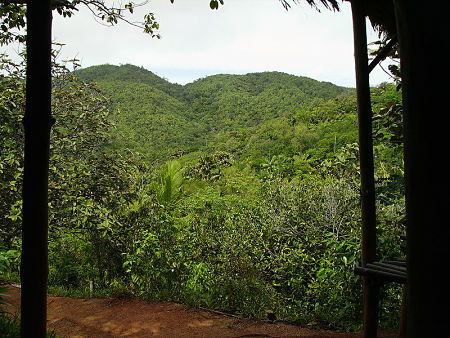 The reserve consists of a unique palm forest, made up of the island’s endemic coco de mer palm, (it has the largest nut in the world) as well as five other endemic palms. This forest, with its primitive plants and unique animal species, is a relic from the time when the supercontinent of Gondwana was dividing into smaller parts, leaving the Seychelles islands lost somewhere between Madagascar and India. And I realise as I am listening to the wind blow though this relic, unique forest, with its large leafed palms, flapping together: I am hearing what dinosaurs would have heard. The hairs on the back of my neck really did rise – again. Trees can do that to you. On a simple walk on an autumn’s day or while contemplating flesh-eating sauropods. Trees are rather magic and used well can add magic to whatever you are writing. A colourful and pragmatic blog post, very well written and interesting. Thank you. I enjoyed it – and I gathered a few potentially helpful ideas.